Happy half birthday to my little man! 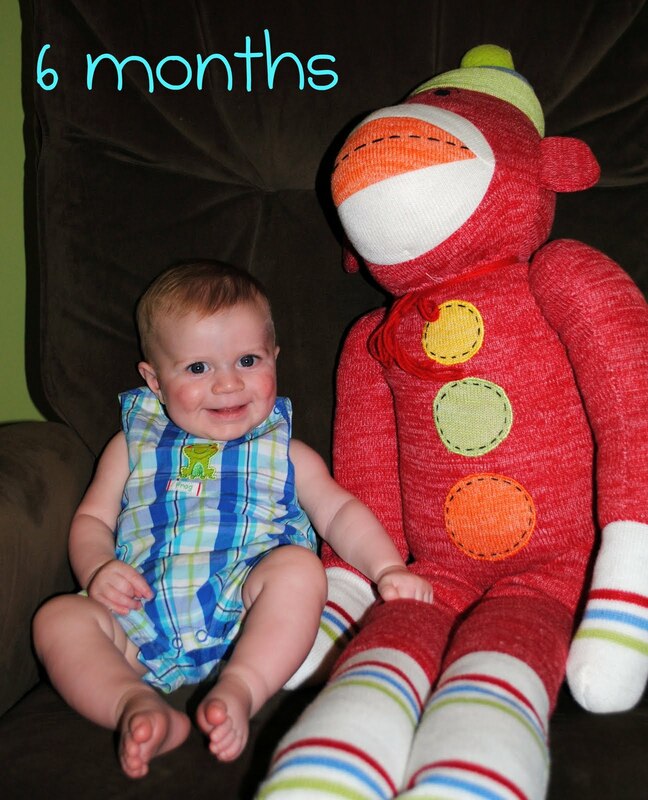 How can 6 months have already gone by?? diaper: annoying! in between sizes. causes a big problem with soaking through clothes! food: still taking 4 bottles a day and eating 1 meal of solids at night. Hopefully introducing a morning meal this week! This has been such a fun month! Grayson gets more and more personality every day. He is so funny! He is a very easy-going baby. Ben and I know we got really lucky...G has set the standards pretty high for the next babies! He really only cries when he is exhausted. Other than that, he is perfectly content! 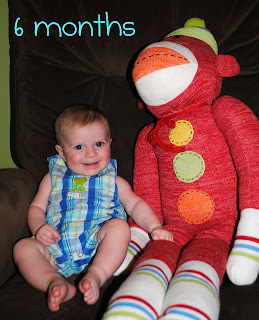 This month Grayson reached a lot of baby milestones! Right after he turned 5 months old, he started sitting up completely on his own. Holy cow...that changes everything! It has been so fun watching him discover things from this new angle. He wants to grab and reach for everything! G also now has TWO bottom teeth! The 2nd one just poked through today. Little guy is a pretty easy teether so far. No fussing, just gnawing...on everything. I will miss those gummy smiles! Grayson also finally started rolling over both ways this month. He can get anywhere he wants on his quilt by rolling. It's pretty impressive. However, not so much in the crib. G now rolls all. night. long. I don't like this whole tummy sleeping thing because I am so paranoid! Our doc said to leave him alone (I promise I didn't keep rolling him back over all night long...) and that it is perfectly fine for him to sleep on his stomach now. This big boy can also stay up past 6pm...HOORAY! We've been trying hard to adjust his schedule to perhaps get him to not wake up at 5am. He now goes to bed between 7:00 and 7:45 and wakes up between 7:00 and 7:30. SO MUCH BETTER!!!! I love this boy more than I ever thought possible. 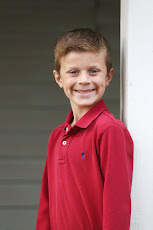 I still can't believe that God chose me to be his mama...I am thankful for that every single day! Grayson has the best little personality and is such a happy boy. I am loving this stage & think it is so fun to see him experience new things. I am soaking him up right now because this is going by so fast! there is no way he is 6 months old. you must be counting wrong!! He is adorable! Can't wait to meet the little guy this summer. Happy half year birthday Grayson! You seem like such a delightful little man.. Momma must be proud!